This article is a short summary of Wario Land: Shake It!. 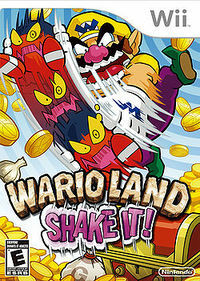 Boxart of Wario Land: Shake It! Wario Land: Shake It! (released in PAL territories as Wario Land: The Shake Dimension and in South Korea as Wario Land Shaking) is the sixth installment of the Wario Land series, developed by Good-Feel and released in 2008. The game's sprites were all drawn by hand, and the game's animated opening and ending were done by Production I.G. Forget the princess–save the treasure! Shake your way to riches! Five huge continents to explore! Shake the Wii Remote™ controller for fun and profit! At the beginning of the game, Captain Syrup has broken into a museum to steal some treasure when a globe and telescope catches her eye. Peeking into the telescope, she sees that the globe houses another world called the Shake Dimension. The other world has been taken over by the Shake King, who has stolen an artifact called the Bottomless Coin Sack and has imprisoned all of the world's Merfle inhabitants, including Queen Merelda. Believing that stealing the treasure will be too difficult, she steals the globe and sends it to Wario, telling him that there is a treasure in the globe. Wario misinterprets the message and is about to smash it with a hammer, but is stopped by the sudden appearance of a Merfle that avoided capture. Wario shows little interest in the Merfle's plight until the treasure is mentioned, at which point he enters the globe and goes on the quest to stop the Shake King. AUS: April 8, 2016 A digital re-release of the game on the Nintendo eShop for Wii U. This page was last edited on 17 November 2016, at 01:10.